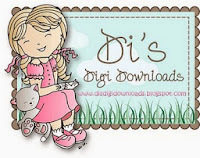 one happy little crafter: Picnic Time wth The Cuties......and a further hubby update! Picnic Time wth The Cuties......and a further hubby update! The sentiment created using Zipty-do font. Marianne Creatables die used for flower. 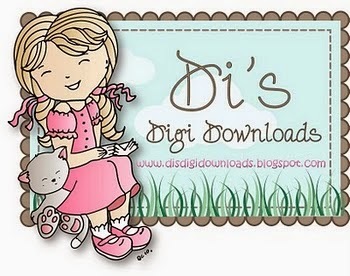 who are offering some amazing digi stamp prizes to our randomly chosen winner.....so lots to play for! Finally, Just wanted to let you know that my hubby was discharged from hospital last Wednesday, since my last post he had had a bit of a rough time of it as his wound became infected and had to be partially reopened, the anti-b's disagreed with him and he suffered chronic diaorrhea for five days, which in turn caused his potassium levels to hit the floor causing him to become very confused and suffer hallucinations.....but these wobbles got sorted and the agreed to let him come home. We have a nurse in to him every other day to change his wound dressing, we had to have the Dr out to him on Monday as he had picked up a water infection that we making him feel even more poorly, so its slow progress, but every day he is feeling a little bit better........we would both like to say Thank you so much for the kind and supportive message, they have been really encouraging to read on the "down" days, and its so nice to be able to share a bit of happier news now. A gorgeous card Lisa. I love the cute image and pretty papers. Glad to hear that Hubby is on the mend, I hope he continues to improve and is soon back to full strength. So sorry to hear about hubby hop he soon recovers. 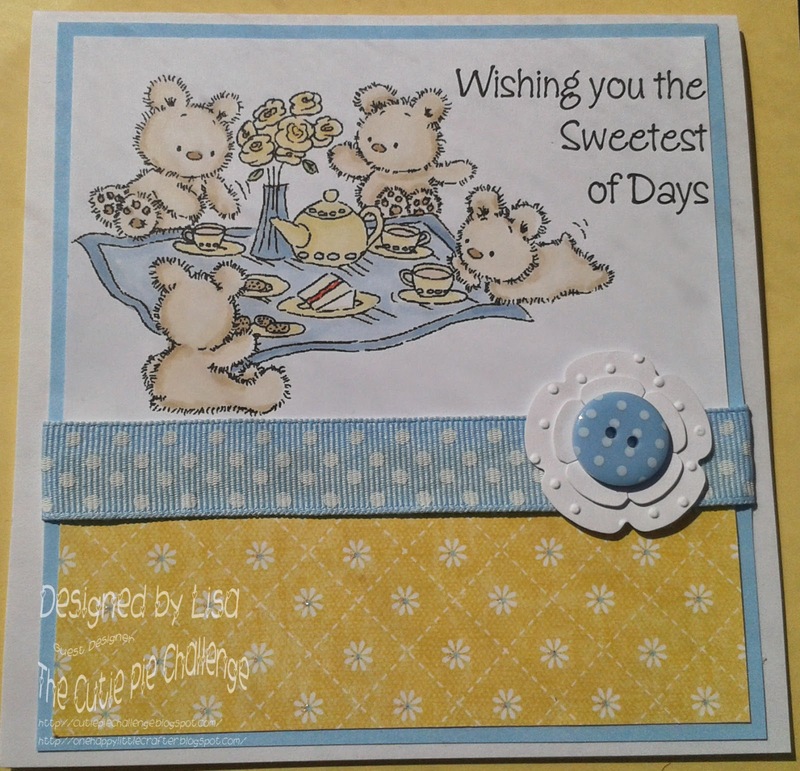 This is an adorable card Lisa, such a cute image and pretty colours. I'm sorry to hear that your husband is having such a rough time, I hope he will begin to feel a lot better now that he is at home. Oh poor you and Hubby Lisa. Awful time for you. I hope it all takes a good turn very soon. Keep smiling if you can. 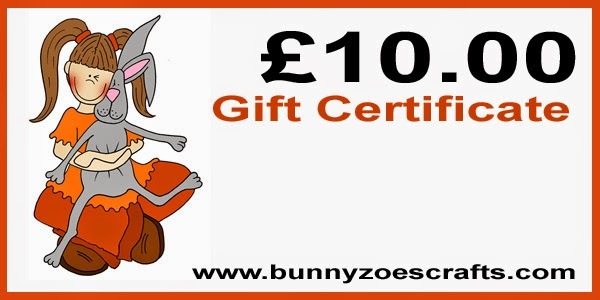 First up Lisa, so sorry that hubby has had it so rough, but good to know that he is improving now, hugs. I love this colour combo, Lisa and your gorgeous soft colouring! 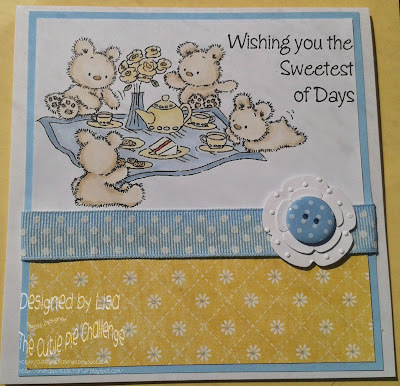 Such a sweet card and pretty colour palette.Love the button topped flower and ribbon. 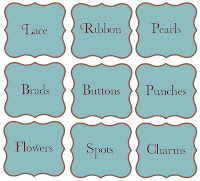 Thanks for joining us at Crafty Sentiments.Hope to see you again next week. Hope your hubby is still making good progress. Beautiful card, love your flower button. So glad hubby is home and getting better every day, He's been through the mill bless him.